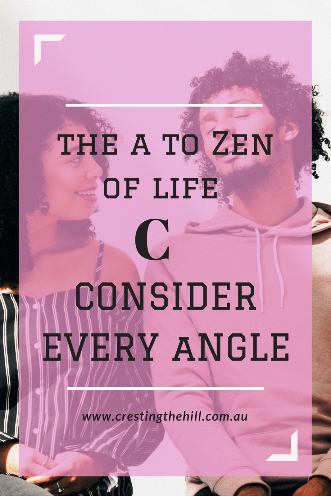 The third letter of my A to Zen of Life (via the Dalai Lama) is C for Consider Every Angle. This is something that you learn as you get older and wiser – you find out that there is often more than one way to skin a cat (as the old saying goes). When I was younger life seemed to be much more black or white. Things were either right or wrong. Now I can acknowledge that there are a lot of grey areas – where someone may disagree with me and have every right to hold their belief – even if it’s different to my own. 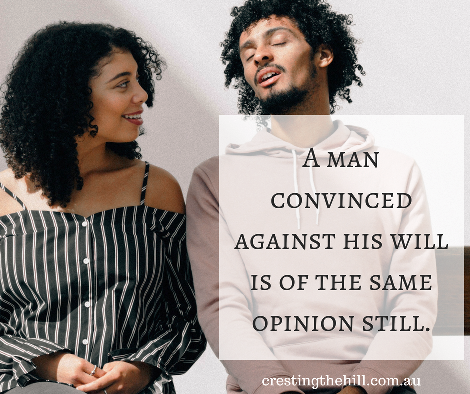 My husband is very fond of quoting Benjamin Franklin or Dale Carnegie - (depending on who you attribute it to) - "A man convinced against his will, is of the same opinion still." In other words, you can’t stuff your point of view down someone else’s throat and expect them to agree with you. With age comes wisdom (hopefully) and I’ve learned that compromise is often the best way to deal with people. 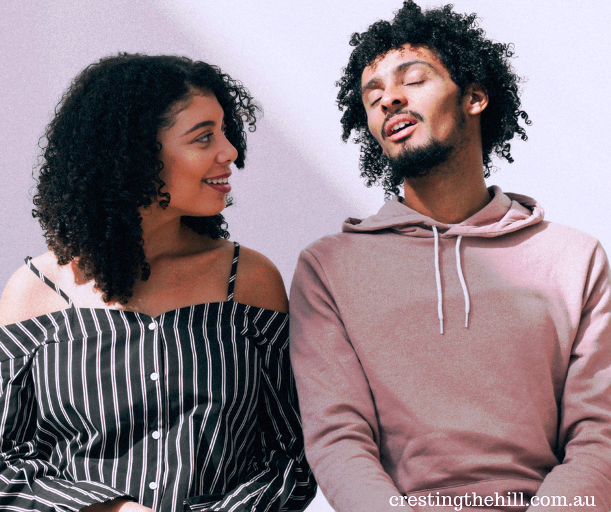 We don’t need to be wishy-washy and change our values to suit others, but we can have the grace to acknowledge that other people are entitled to their values and beliefs too. The world would be a lot kinder and more peaceful if we could learn to live and let live. We can’t change the world, but we can change ourselves and in the process, offer kindness and grace to those around us. 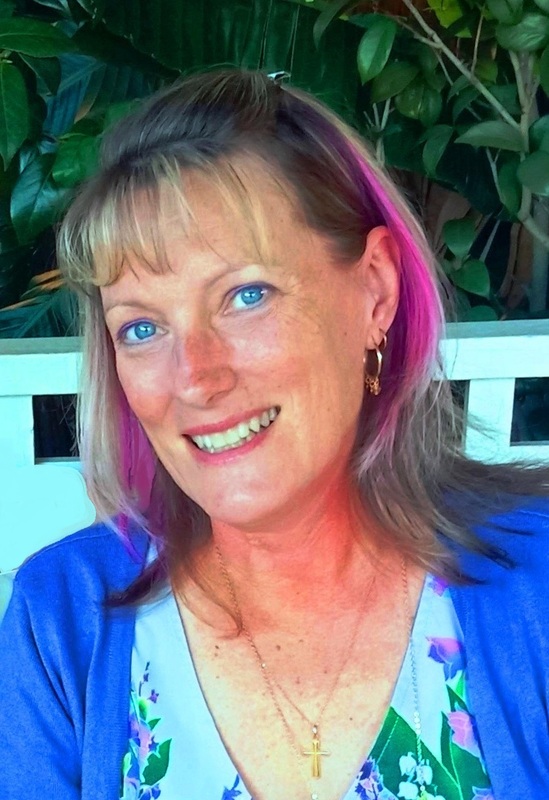 Are you a stickler for insisting that you’re right? Or are you open to considering things from someone else’s viewpoint? Who knows, we might learn something and broaden our worldview if we’re prepared to consider other people’s points of view. Hi, Leanne - I agree that with age comes wisdom. Also as I age, I am less likely to want to take on a 'strong debate'. Live and let live. I'm loving you A to Zen of life Leanne. I remember how impossible it was to try to convince my teenaged that there are shades of grey. What a great theme for the A to Z Challenge! I agree that with age and maturity comes consideration of other viewpoints and compromise. I used to be a black-and-white person too when I was in my 20s. I have a strange relationship with compromise and consider - in my younger days I have overdone both those things to such an extent as to forget my own point of view. So my wisdom has been to consider but not to compromise my beliefs or desires unless I have thought it through. Hi Leanne, I have to agree with Sue's comment I was a very black-or-white person when I was younger. As I've grown up and hopefully matured, I've come to see there are way more than forty shades of grey! And many of them are right! It's so important to learn to compromise, provided you don't change your standards. Care for and Love your Body and Brain! Another thoughtful post. It can be quite a skill to compromise without compromising your values, but the important thing is consideration as you say. I so admire how much thought you're putting into your posts for this challenge Leanne, and totally agree that while we shouldn't compromise our own values, we should definitely offer grace to others. "Live and let live" can be a bit of a tricky one though, as I've discussed at time, shall we say "energetically", with my youngest son, the "idealist" (lol). And I'd like to think that those who love me might actually be willing to engage me if I'm heading in a direction that could be harmful to me or to others, even if I think I'm "right". I'm grateful for the people in my life who speak truth to me. As a Christian it can also be a real challenge to hold the tension between allowing others their beliefs, and obeying the "great commission". These are such important lessons to learn. I used to see things as very black and white too, the older I get the more grey areas I can see. As an INFJ, I think I'm fairly good at putting myself in other people's shoes and understanding the reasons behind their perspective. Compromise is definitely something I am still working on, as my husband will attest! This is a tough one for me, and for many Americans at the moment. I have always tried to see all sides - it is part of being an anthropologist, but lately when so many have entrenched and are purposively working from a position of hating the other... it is demoralizing at best, and far too often crippling to all exposed to it. LOVE this! You are right compromise is HUGE! I really think that if we were more willing to compromise, in kind ways then there would be a lot less hate and anger in this world. Love this post! I'll be back for more! Goodness Leanne, you are making me think! I've often felt my way was the right way...but yet, I have also been very accommodating to others. Sometimes too accommodating, letting their needs over-ride my own. I firmly believe in live & let live, as long as your beliefs/life choices do not negatively impact others. I think it's more: My life, my choices. Your life, your choices. Don't force your choices on me. I'm not sure if that is compromise or consider every angle. See - making me think.... and only once cup of coffee! I remember defending my opinion to the point of blows when I was young. Now? I'm totally happy to hear other people's opinions. But I do still voice my own. Several years ago I gave up being stuck in my opinions. I have seen so many people sacrifice relationships and peace for their prideful stand on an argument. I would rather have goodwill with others. Great post. &*> For some reason this gave me a flashback, a memory tucked away for some years and now aired by your observations... There was a conversation going on with the 'grown ups' around our family table wherein some very B&W, cut-'n'-dried views were being aired against each other. At all of seven years of age I waded in and told them off for not talking kindly to each other and that all could be right or equally all could be wrong... From that I learned that one didn't speak one's mind, one just sat in the corner and didn't say boo to any goose. Which I did until my 20s, then I refound that voice for balance and sharing of views, regardless of their difference. I loved debate when I was younger. Now I'm happy to just be happy and, like Donna, to live and let live. With you on all points. Thankfully, our experience gives the where withal to be Wise beyond our days...or perhaps we are Old Souls. "have the grace to acknowledge..." yes. I've gotten much better at acknowledging the validity of another's view. But I guess it's kind of reversed now. I live in China, and when State-side friends would question our choice to move, or urge us to return, or present otherwise im-palatable views, I very quickly shut them down with a "grow up and get it" message. I guess they are entitled to stay close-minded, too! Good one Leanne! I often take then road of least resistance but that doesn't mean I am a pushover. I don't like conflict! I like to take in all sides of the situation and I think it is something you do get better at as you get older and wiser. I do speak my mind and have an opinion but I think I'm getting better at considering every angle. I'm very much a shades of grey girl - not the 50 shades type though! Seriously though, I rarely think in black & white - there's always another angle or another layer.